“Move over old dog, the new dog’s movin’ in”. 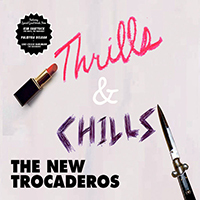 Like George Thorogood and Hank Williams before him, The New Trocaderos stake a claim to their piece of rock n’ roll turf with the release of their 1st LP entitled Thrills & Chills. Chills & Thrill is a follow up to the band’s EP of earlier this year entitled Frenzy in the Hips. This time around, the band (Kurt Baker, Geoff Palmer and Brad Marino are joined by Rick Orcutt on drums and Kris Rogers on keyboards) stretches its creative muscle, moving effortlessly from rockabilly to blues-rock to power pop, varying tempos, themes and instrumentation. And the’re not afraid to show a sense of humor too. The opening and final tracks, “What the Hell Did I Do” and “Business To Tend To” respectively, act as bookends to a novel who’s chapters delve into other styles and genres yet in the end, seem to build upon each other until we’re taken full circle to a resolution. 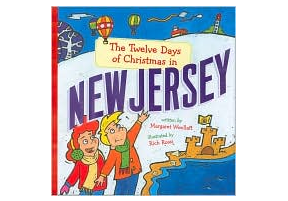 Kinda like a good book. The songs are more fully developed than on past releases as Kurt Baker and Geoff Palmer alternate as co-author with Michael Chaney for the bulk of the songs on Thrills. “What The Hell Did I Do” is a straight ahead rock n blues number out of the George Thorogood book of kickass. The Trocs channel The Stones for “I’m So Bad” and “By The Balls” has the kind of sing along (shout along, actually) chorus one cannot resist – and adds a well placed element of humor to the powerpop proceedings. “Hey Big Boy” continues the humorous mid chapters of this rock n roll book while “Love Amymore” shifts gears to a vocal driven piece Straight Outa Memphis.My favorite track however, may be “Midnight Creep”, a song about a two-timing woman with keyboards that are so perfect you’ll be reminded of old favorites like “96 Tears”. The LP comes full circle and resolves itself with another Thorogood/Elmore James style rocker entitled “Business To Tend To”, making for the perfect exit. The songs on Thrills & Chills are more resolved than on previous records. As much as I like Frenzy in the Hips, these songs are an artistic leap forward. Kudos to Michael Chaney, Kurt Baker and Geoff Palmer for creating a “power pop” record that is more diverse, interesting and most of all, fun. If you’re a fan of Rockpile, Dave Edmunds, Nick Lowe, George Thorogood, Chuck Berry or The Rolling Stones, you’ll dig this record. If you’re a fan of The Connection or Kurt Baker Combo, you’ll really dig this record. If I were you, I’d Buy it HERE.